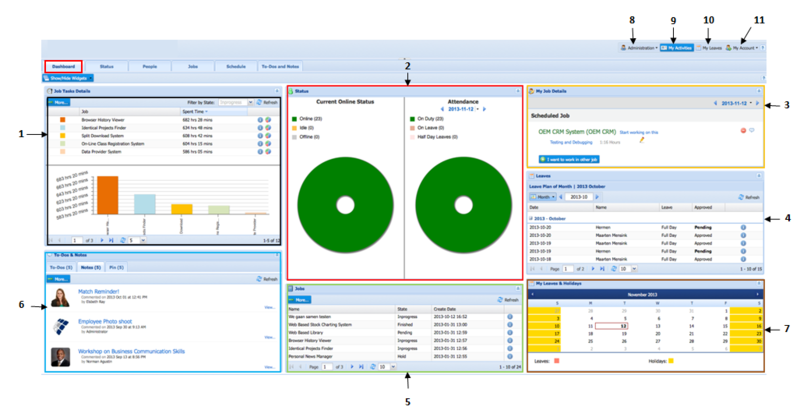 The following diagram describes the tools and some of major feature available in the dashboard of OPPTIMO application. You can easily add/ remove & arrange these available tools/ widgets to manage your dashboard. According to the user type, dashboard will be different based on their privileges allowed over OPPTIMO application. Job Tasks Details Widget - It shows the amount of time spent in each job task. This widget facilitates to identify what kind of jobs have spent more time. Status Widget – “Current Online Status” shows users online status of this movement and “Attendance” shows users daily attendance for the given date. Users can also browse attendance by date. My Job Details Widget - Display current user job details. It also facilitates to browse job details by date. Leaves Widget - Easy way of managing users leaves. It also facilitates to browse leave details by date. Jobs Widget - You can view jobs details by this widget. It only support for view details. Users can manage jobs by switching to "Jobs" tab. To-Dos & Notes Widget – An easy way to access latest To-Dos and Notes. There is another tab for access pinned Notes and To-Dos. My Leaves & Holidays Widget - Display current user leaves details. It also facilitates to browse leaves & holiday details by date. Administration – To manage teams, users, holidays, leaves, countries, tasks, billing & lists. My Activities - This option is used to start / stop work on scheduled or unscheduled job. My Leaves - This option provides all details of leaves that the user has applied. Further, users can request, removing and change leaves though this option. My Account – Provide the facility of managing your user account details. You can either enable or disable above mentioned dashboard widgets from option. You have to rearrange the dashboard widgets if you log in to OPPTIMO using a different browser or a computer.